The following three diseases–pinta, yaws and bejel–are produced by different variations of the same pathogenic organism–Treponema pallidum. Treponema pallidum has endemic and epidemic regions. The endemic regions are places where it has a lengthy period of existence as a non-sexually transmitted disease of the skin and flesh. Within these endemic regions, this organism presents itself in a variety of ways, for each of which different local names exist. Pinta is a disease of northern South America to Mexican places of origin, and is introduced into this country through in-migrating people with this disease. Yaws is a second skin-flesh variation of this disease introduced by African and Southeast Asian to Macronesian in-migrating people. Bejel is a variation of the Yaws noted for the Middle Eastern setting, also made a part of the local North America Public Health history due to in-migration patterns. These diseases represent several interesting public health related issues, behaviors, patterns or concerns, depending upon the point of view. Mapping these diseases and then comparing them to their geographic history and behaviors provides a significant amount of insight into these disease patterns and provides us with useful information applicable to prediciting their future migration patterns. Historical maps suggest the zones these diseases cover have expanded over the years, especially for Pinto and Yaws and any related Endemic Treponema disease patterns. More recent maps provide information regarding the in-migration patterns such rare diseases can take. Nearly all of these in-migration patterns are products of human behavior. This behavior may be linked to naturally-induced microbiological diffusion-disease migration patterns, in-migration habits practiced by foreign residents, or to deliberate in-migration patterns initiated and supported by specific agencies linked to these sociocultural groups. The possible causes for diffusion have a number of highly sensitive issues attached to them. They relate to such controversial issues as foreign born diseasepenetration into this country, to concerns with the numerous poverty-related health and quality of life issues that exist locally and abroad. By enabling old world living practices to remain a part of new world lifestyles in certain sociocultural settings, diseases like pinta, yaws and bejel, or variations thereof, could become part of the local epidemiological history and disease geography. The organism responsible for Pinta is a treponoma bacterium Treponema carateum (alt. T. pallidum carateum) infecting the skin. This bacterium is closely related to the bacteria responsible for Syphilis, Treponema pallidum, and is particularly common to certain parts of Mexico, as noted in the 19th century map on Mexico’s medical geography posted elsewhere at this site. This infection produces a mottled skin condition known in various locations as belesh, dichuchwa, frenga, njovera, siti, and skerljevo (see wikipedia page on Nonvenereal Endemic Syphilis). In Mexico and parts of Central and northern South America, this condition is called Pinta, named for the resemblance of its color pattern to those seen on Pinto horses. Treponema bacteria present us with a classic example of disease geography. Since the early nineteenth century, if not even earlier into the late 18th century, physicians and scientists have noticed the link of certain diseases to the tropics of the world. This part of the world came to be known as the torrid zone, and was considered an area mostly uninhabitable, with those that lived in these regions highly susceptible to diseases brought on by local climate, heat, humidity, weather fluctuations, putrescence, and the like. Further review of disease distributions during the late 18th and early 19th century even led scientists and physicians to conclude that some diseases were endemic in nature for these regions, always present in people who resided there, whereas others were epidemic or introduced from afar. The endemic diseases were native to a give region, which in the tropics meant they were tropical born and presented. Epidemic diseases on the other are introduced into the human living environment, and since most diseases came from the tropics, they were those diseases introduced into the cooler parts of the globe. Certain endemic diseases characteristic of the temperate and even frigid or arctic zone existed as well, like the beri beri, goiter, scurvy, catarrh (coughs and colds), and goitre typical of isolated communities in these regions. These diseases were often blamed on the cooler, temperate climates of these regions of the earth and usually associated with unique local topographic features, weather patterns, humidity, rains, snow, and once again, putrescence. Treponema diseases illustrate a tropical endemic behavior for the most part, with epidemic behaviors more typical of latitudes greater than 20 to 22 degrees North or South, heading into and through the neighboring temperate zone. 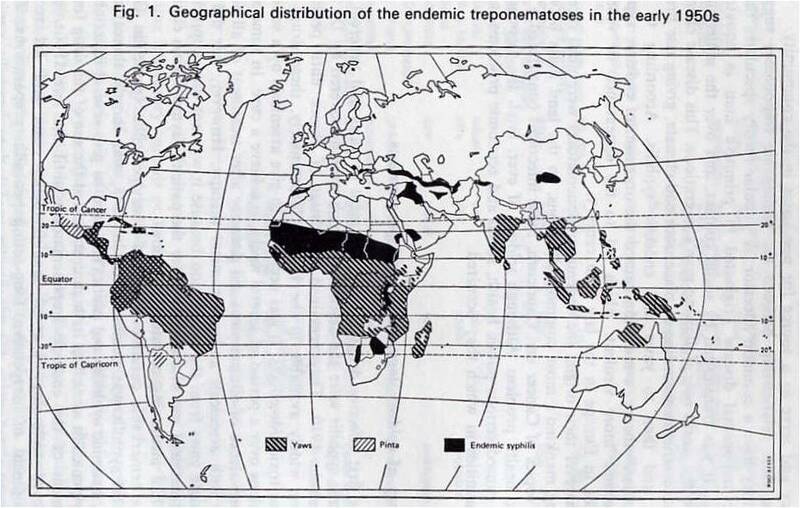 In the following 1950s map of treponema distribution, we see large tropical area endemicity patterns for “endemic syphilis” [black], in both the north and south hemispheres. We also see a cluster of small endemic regions for syphilis in parts of the Middle East and Asia. These follow a latitude line indicating a possible relationship with local weather and regional climate. Yaws follows the adherence to latitude rule for tropical endemic diseases more precisely. Usually the boundary between tropical or torrid and temperate regions within the older 19th century maps is identified as somewhere close to the 30 to 37 degree latitude line. The isotherm line used to define this boundary changes slightly over time, but is also within the 35 to 38 degree Fahrenheit range. According to this 1950s map, Yaws and Pinta both remain fairly well contained within the 20 to 25 degree North and South latitude lines. The distributions of these three treponema based illnesses on the above map demonstrate how large area geography is capable of understanding the migration and evolution of this diseases. Both natural and human ecological (travel and migration) features exist for these three diseases, with epidemic regions more tied to human ecology and natural ecological features. This is a common theme for nearly all vector and natural microbial disease patterns noted in medical and veterinary medical books. Another important evolutionary feature to note here spatially is the possible involvement of certain evolutionary processes in the development of these three distinct treponema diseases. Isolated island communities are found for the treponema in parts of Central and Southeast Asia. These possibly make it more likely for a given genotype of bacterium to evolve into a new genotype and/or pathogen, such as a more medication resistant strain of syphilis or a uniquely local new version of skin disease resembling pinta or yaws. Isotherms remain a very important inhibitor of disease/pathogen migration beyond the tropical zone, into the warmer temperate regions. These heavily population sub-tropical regions serve as potential starting points for temperate zone based epidemics. In the US, such regions exist in and near Mexico and the Carribean Islands. Due to the barrier formed by the Pacific Ocean, a west coast introduction of tropical diseases of treponema would most likely be related to Mexico and the Baja peninsula, and less so to a possible migration route involving the Hawaiian Islands. In Africa these skin conditions produced by Treponema pallidum pertenue are commonly referred to as yaws (see http://en.wikipedia.org/wiki/Yaws). This non-venereal form of infection is closely related to Pinta, caused by T. pallidum carateum, and endemic treponema caused by T. pallidum endemicum. In the following early 20th century map, Yaws demonstrates a very distinct latitude relationship in Africa, parts of Southeast Asia and the Philippines, even the Americas. There are several island community settings, very small in SE Asia (Vietnam, Cambodia area) and India-Ceylon. The more northern these communities are, the more likey it is that they either evolved later and separately from the original disease nidus, or are remnants of a very old, much larger distribution area. Due to the nature of these diseases, the former scenario appears to be more likely for the northernmost island communities. It is also possible that the Southern American locates with treponema-yaws, are secondary sites produced de novo or as a result of re-introduction (suggesting the disease was once there and is re-emerging). The likelihood of a traditional native variety of treponema is suggest by the west slope nature of the cases east of Chile and Peru. The western coastline nidus for Yaws treponema is possibly linked by shipping routes between this part of the Americans and the Malaysian to Melanesian regions extending eastsoutheastward towards Fiji, Tonga and Cook Island. 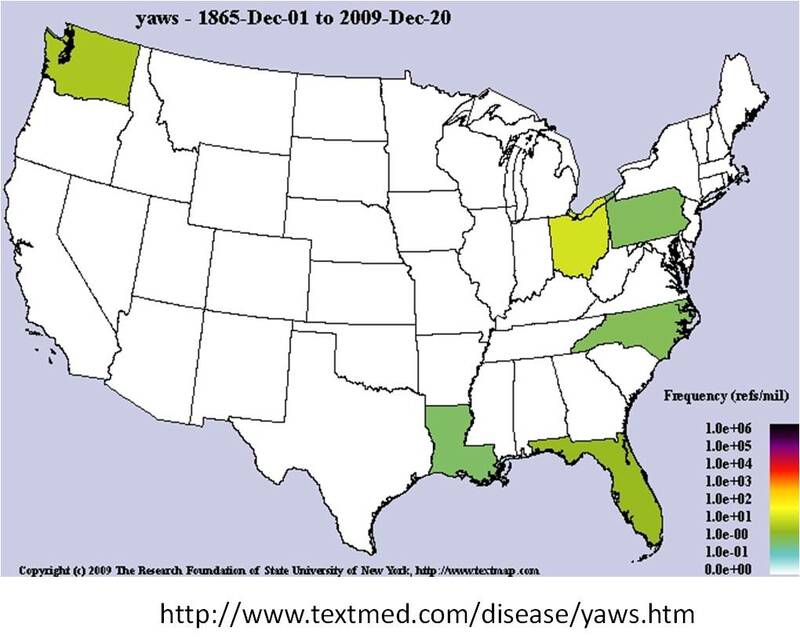 The next map confers with the spatial distribution of yaws in a national grid map of the US.. Some of the paths taken by this disease into the United States are defineable–the Florida and Louisiana frequencies may be directly related to the Central and South American and Carribean history of this disease. African in-migration histories may also be linked to these two state, as well as the North Carolina and Pennsylvania history. Florida, Ohio and Washington demonstrate higher rates relative to the others. The highest count of cases and frequency is associated with Ohio. No reasons for this spatial behavior have been uncovered, but may relate to the history of this region during the early to mid-19th century, and the migratory routes formed by the Mississippi River, the Great Lakes, the Ohio River and the St. Lawrence Seaway. Bejel is caused by Treponema pallidum endemicum. It is most common to arid eastern Mediterranean countries and West Africa. The disease is spread either through direct oral contact or indirectly by eating utensils. The disease first presents as a lesion or patch in the oral cavity, which forms into a raised, eroding lesion. Similar lesions then form on the limbs and trunk. Long term tertiary syphilitic infections known as gummata (pl. gumma) form over time, along with inflammation of the leg bones. The gummata present as a necrotizing area surrounded by a swollen, red area of intense inflammation, with indiscrete edges, and an ulcer-like appearance lacking much granulation or signs of tissue recovery and healing. Long term effects mimic many of those of tertiary syphilis, and include deterioration of tissues in and around the soft tissues of the palate. Penicillin is the treatment for this illness. This anomaly in case distributions usually relates to one thing: missions and tertiary or quaternary (highly specialized/advanced) health care programs. A common theme of missions is medical, and churches/programs often receive significant help in bringing patients who are ill back to this country for advanced care. We see this for several other diseases. The missions and/or cities engaged in these services are not always the same. 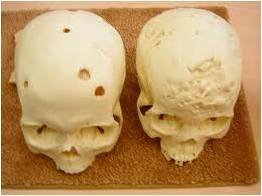 Another example of this is the viral oral and facial flesh highly debilitating disease Noma (usually from Africa). Another set of interpretations for these results pertains to illegal immigration. The following map depicts a Mexico-Yucatan specific ecological disease that is predominantly due to exposure in the environment, not to other people with the condition. However, outbreaks can also mimic this effect. Take for example the following examples of diseases migrated into this country, perhaps even due to illegal immigration and lack of a preventive health check. El Tor Cholera may be linked to Peruvian shorelines, the Gulf of Mexico ecology and maybe Mexico by way of food habits practiced by Mexicans and/or tourists returning to the U.S. The spike on this map suggests an human or ecological outbreak. Its west coast proximity suggests, but doesn’t necessarily strongly imply, Peruvian offshore-seafood diet origins. The following are two evaluations of in-migrating disease patterns in general from the Middle and South American regions. The first map is of the basics — diseases that are behavioral (lack of immunization) and/or contagious. The second map depicts diseases added to this list that are linked to origin, but may not be spread readily once in the U.S. This method of GIS application I developed for a biosurveillance/episurveillance method of monitoring disease in-migration beginning sometime around winter of 2005/6, per request of a government contractee. Approximately 250-350 diseases specific to different parts of the world were evaluated, as part of a national security review. NOTE: These diffusion maps focused on US disease penetration from other continents/regions were produced for a number of other global regions, and may be reviewed in Youtube by clicking on any of the above and seeing the list of others pop-up at the end of the video.